I have a very, very long list of writing ideas. These can vary from full-fledged beat sheets and character profiles, to a query, to a Twitter pitch, to just a premise. But this post is about what I wish I had ideas for. Something more vague and more beautiful. P.S. : Basically I stole this idea from Christina from, like, months ago. Go me. Personal observation: most relationships with age disparities have an older man and a younger woman. I recently studied The Go-Between and The Reader in literature class, both of which genderflip this phenomenon. I sort of want to explore this dynamic too, especially with an arranged marriage. Have to work on writing romance, though. It's no secret how much I enjoy Shakespeare, especially after the other month's #LitLove. My favourite of his works is probably Hamlet, but I'd love to do a retelling for Macbeth. Preferably humour while pointing out all the plot holes. Really, though, any one would work. 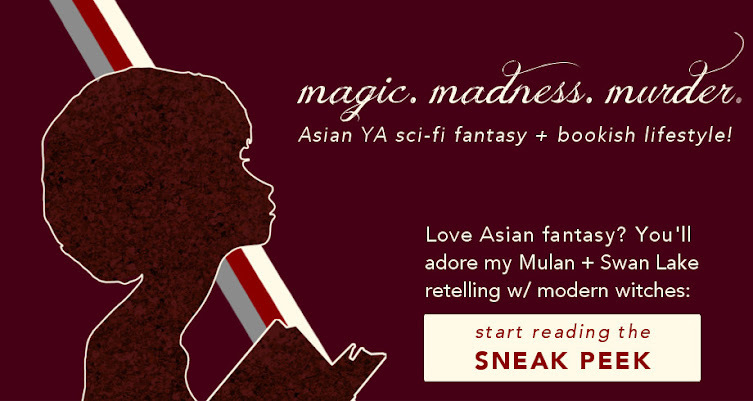 If you read my Chinese Culture post on Mulan, you'll know I based Winner Takes All partly on that slice of Chinese folklore. I have a penchant for all sorts of tales and adore retellings. On that note, I'd also love to write a retelling of a Chinese creation myth. We have people who turned into seas and hills and archers shooting the sun and giants holding up the sky. It's awesome. When/if I pursue a career in academia, it would be really cool to portray it in writing. Whether I'm finally living out my dream of being an evil scientist, or just endlessly lounging around in labs, I think it'd be worth sharing. Or I could just pretend I'm an evil scientist. Confession: I've never read a stream-of-consciousness novel. I've read short stories and poetry, but I just love it so much I desperately want to write one of these. So much psychology and symbolism and the portrayal of a mind in its cluttered form just fascinates me so much. Synesthesia is conflation of the senses — specifically, here I'm talking about "grapheme → color synesthesia" according to Wiki. It's when you see/hear/taste things in terms of colour. I've always harboured a fascination for colours, and even wrote a spectrum of prose poetry, and I think it sounds beautiful and terrifying all at once. And I want to know more. In Star Wars Episode I, one of the Queen's maids (Kiera Knightley) acted as a decoy for the Queen (Natalie Portman). I'd like to tell a story like that, but from the maid's perspective as she's given a position of power and no power herself. Also, there's politics and politics is fabulous. Any of these you'd love to see? Share with us in the comments! 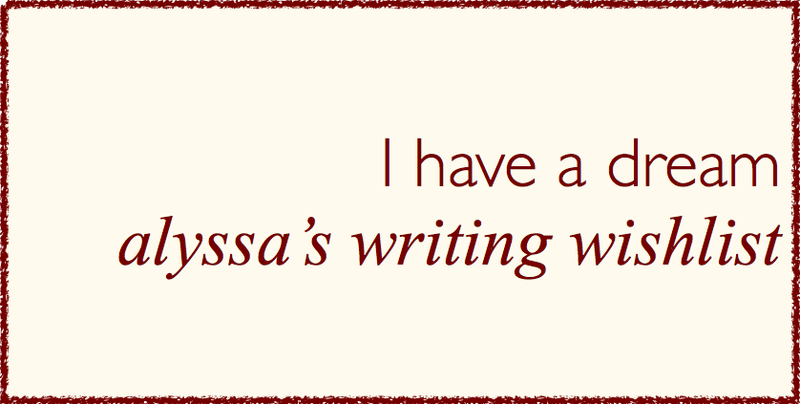 Want more sneak peeks at my writing muses? Let me send monthly letters to you and my mind is yours! Well yes, Vicious experiments were vicious but not too realistic. No self-respecting scientist would ever carry out experiments on such flimsy grounds, let alone on themselves. *academia snob* I totally WOULD write it all except these aren't even the full-fledged plots, I'm never going to have the time. I should just take life off for writing. Ooh, I remember when Kara posted her writing wishlist. I was going to write a post, but then I kind of...didn't. I should take the time to do so, though, because I would love to write this kind of post. I have so many ideas for books that I want to write, and it's ridiculous. I really like your idea for a stream of consciousness novel. I think that holds a lot of capacity for gorgeous writing with meaningful depth. It would be really difficult to write, though, but I'm sure you can do it! I would love to see a post of yours! A stream of consciousness novel is probably something to attempt when I'm older, more experienced, and more likely to get a Nobel Prize for my efforts XD Thank you for your kind words! You just have bubbles of special, awesome ideas. They're so cool. The maid-as-a-decoy story sounds awesome, although if it were me the maid would probably kill the princess or something and it will turn into a very dramatic retelling of the prince and the pauper that results in something super confusing and ridiculous. XD I am all for everything evil scientist, Shakespeare, and folktale. The latter two especially because I think they're kind of the dirt in which we grow our other stories. And even if they've been used before, they're special enough to be used again! I have bubbles of ideas but far too few bubbles of time. Must go on RPG adventure to collect more! XD I don't think I'll be going that route exactly, but I'm glad you like the ideas. And yes, that's what's great about retellings! A Shakespeare retelling would be so awesome! Also the last one. That would be very interesting to see things from the maid's perspective. Is she a very loyal maid? Does she want power? That would turn up a lot of conflict. What if she cares nothing for power at all? The possibilities! This sounds super weird when I write it out, but ahh THANK YOU for stealing my post idea. Which I, in turn, stole from like three other people. So hmm. #1 seems interesting, especially since you don't tend to write romance too much. It looks like our brains pretty much align on the Shakespeare retelling and folklore retelling fronts. Hamlet is my personal favorite, too, with Macbeth and Othello coming in as close seconds. And FOLKLORE FROM ASIA IS TOO COOL. To be completely honest, though, my favorite item in this list is MAID AS DECOY. OHH MY GOODNESS. I'm semi-planning a high fantasy/gothic/THING that has some of those elements, but I'd love to see your spin on it as well! JUST WRITE ALL OF THESE AND TAKE MY MONEY. Please and thank you. Our brains just align TOO WELL. I enjoy folklore, but mostly local folklore interests me though. I just can't keep track of everyone! And ha, accidental rhyme indeed. I think I'd just have to be myself for that entire novel, if I ever write it. AAAAH. I WANT TO READ THAT. I'm probably definitely going to write the maid as decoy story at some point -- might take elements of Needlepoint and sift it back in. Aw, thank you so much, Jillian! I'm glad you like these ideas. Funny, someone else mentioned Merchant of Venice and I'm studying it next year. Let's see, I'm not sure how much I like that one. Macbeth is super cool, though. Thanks for dropping by! But actually any of them would be great. I don't like writing romance either, mostly because I know nothing about it. THAT IS GREAT. They would be like the evil academia version of Diary of a Wimpy Kid. OMG. Is VICIOUS meets DIARY OF A WIMPY KID too weird a comp title? Oh, I love all of these! I'd love to write a Pocahontas retelling someday (you know, when I actually finish writing the other half-written novels, first XD), so a retelling of a Chinese creation myth would be super cool to read, especially since I know absolutely nothing about that! I've never actually heard of the specific maid-as-decoy POV before, but I am quite familiar with the decoy part, so it'll be really cool to see what you do with it! Pocahontas YES. I only know it from Disney, in which case it's probably all legally protected, but I'm sure there's an original somewhere too. I'm not too familiar with Chinese creation myths either, but I'd love to learn more about it. And the decoy idea seems pretty popular, so I shall try to include that ASAP! You could have just used your whole blog as the evil scientist modern humour novel, hehe. But seriously though, with your amazing ability to explain science plus your humour, you can definitely pull it off :) . The way you talk about those Chinese folklore made me giggle. It just..sounds kind of comical, especially when the original stories are so epic and serious. And here we have a legend of a revolutionist who can speak to ducks. actually know an MG book about synesthesia (it's also one of my favourites) called A Mango-Shaped Space. It's cool and kinda cute but there's also adversity the MC has to face. Basically it's fabulous. Also, do you know an artist called Kandinsky? He had synesthesia and drew what he saw with his synesthesic visions. Fabulous as well. Your posts can always stimulate lots of thoughts from me and I just couldn't not comment. And I always end up writing really long comments. Oops. First of all, long comments totally make my day, so don't worry about it AT ALL, Melody! I'm glad my posts stimulate discussion -- that's what I'm here for! The Shakespearean language is absolutely gorgeous, but the themes and such are excellent in (some) abridged versions too. I'm studying MoV next year! That's exactly what I'd like to capture in that novel -- how erratic our thoughts are. We'll see. I shall check out that music video! And haha, I shall definitely repurpose parts of this blog for that novel if I ever write it. I'm glad you liked my summary! Hehe, that sounds like a story indeed. And I'll be sure to check out Mango-Shaped Space and Kandinsky's works -- thanks for the recs! So I was just flipping through my history textbook and GUESS WHAT? Right there--stream-of-consciousness novel. It's a technique often used by modernist literature, and a really famous writer of it was James Joyce. Cool, right?! Coincidence? I THINK NOT. I've heard of James Joyce, but I'm just not a fan of older literature in general, with maybe a handful of supremely awesome exceptions. But still, thanks for letting me know! Will drop by to take a look! Al of these are such great ideas! Is WTA still WTA or The Dead Queen? Both are wonderful titles, of course, but WTA kind of reminds me of an ABBA song, which isn't so great. I was going to tell you about A Mango Shaped Space, which I thought was really good, but it looks like Melody beat me to it. And ooohhh I Want a shakespeare retelling, even if I'm not shakespeare's biggest fan. I don't really write, but I keep having all these great ideas. (Like a retelling of Diana and the Golden Apples or a contemporary fantasy blend where these people are sitting around a campfire or something telling a fantasy story and taking turns. So each 'chapter' has a different voice and you learn more about the people telling it as you go.) Aaanyway, nice post. I'd also love some more about Chinese culture, especially from someone like you who clearly knows a lot. WTA is still WTA -- you lovely newsletter people actually made it a draw, but all my betas said WTA, so that's that. Aww, those sounds like fabulous ideas! What a shame you don't write -- perhaps you'll find your potential to do so later, or you could find a ghostwriter/someone who does commissions? Because I would love to read those stories. Oh, so many of my books have Chinese culture. I do concede some of them don't, but 50% of my ideas are set in China anyways. I've always thought a retelling of Twelfth Night (my favorite Shakespeare play) would be super fun. And a gender-flipped May-December romance would be AWESOME; I hate that when a man falls for a much younger woman it's business as usual, but when you switch it around it has to be quirky and artistic and weird. Not that I don't love quirky and artistic and weird, but it's such a double standard. And a maid-as-a-decoy story sounds wonderful, too. I really hope you get the chance to write these one day! I'm so-so with Twelfth Night, at least relative to other Shakespeare plays. Yes, that's exactly the trope I wanna play with! I'd still explore social stigma though, I think. I certainly hope so as well -- one can only wait for the words to come! I'm all for an evil scientist book! Oh, have you read A Mango Shaped Space? (Looking at the comments, I see it's already been suggested.) The main character has synesthesia, and that was the first time I'd heard of it. Extremely fascinating. Another book you might try (if you haven't already) is Shadow Spinner by Susan Fletcher. It isn't quite the maid-as-decoy scenario you described, but it tells the story of Shahrazad from the perspective of her maid. These are some awesome ideas! I hope you'll get the inspiration to write them. I especially love the idea of synesthesia! There was a Korean drama recently released in which the main girl could see smell. It was very fun, but I would love to see the idea in other medium. Thank you! Korean dramas are quite lovely in their diverse selection of topics, even though I'm not so interested in the romance. Ugh, now I'm lusting after a synesthete in the WTA-verse. I wonder how it would affect a Delennian's perception of ghosts? So many possibilities! It was originally Martin Luther King Jr, but why not both? Both. Both is good. *winks* But have you seen those Tangled vs writing comparisons? SO ACCURATE. Basically every comment before you recommended A Mango-Shaped Space, so I suppose that's the most well-known book on the topic. Which also makes it SUCH a shame. WE SHALL SEE. You had me at evil scientist! I was always fascinated when watching the James Bond films when I was younger how on earth the managed to get funding and stuff to build their lairs inside hollowed out volcanoes! I would definitely read about that! I know right?!? I was actually deceived into thinking that scientists really just did science for fun before realising you had to look for grants and write papers and stuff. LIES. Oh yes, I saw that post too! Really intriguing idea, about intention vs goals. Would be a HILARIOUS sitcom. I am SUPER keen on the last one. Imagine if the prince/princess fell for the maid and voila! She IS the other princess. That would be super awesome.